Disciplinary complaints against appraisers have become more frequent over the last several years. Of course, not all appraisal complaints result in disciplinary action. If you have had a complaint issued against you, you’re probably curious about how it will be handled. Let’s take a 30,000-foot view of the enforcement process—the details of which will vary significantly from state to state. Want to avoid disciplinary complaints? Learn about common violations and how to avoid them in our top-rated CE course: That’s a Violation. Each state has its own set of administrative procedures used to handle disciplinary complaints against licensees of various professions, such as appraisers, real estate agents and brokers, doctors, nurses, accountants, etc. In many states, the same administrative procedures are used for all professions, and the disciplinary process is governed by state law. This law is often called the Administrative Procedures Act, but some states call it something different. It addresses the issues regarding who processes, investigates, prosecutes, and adjudicates complaints. The specific procedures vary significantly from state to state, so we can’t get too deep into mechanics of the system. How your state handles disciplinary complaints against appraisers is undoubtedly going to be different than how my state handles them. Here is a flowchart demonstrating how appraisal complaints are enforced in one particular state. Again, your state may be a little different. The process typically begins when a complaint is filed by an individual and is received by the state entity that takes the complaint. In this state, they first determine whether or not they have jurisdiction. This is a good first step because you would be surprised at the number of complaints that are filed with appraisal regulatory agencies where the complaint is filed against a lending institution, for example, and the appraisal regulatory agency doesn’t have jurisdiction. The appraisal regulatory agency has to weed those cases out first, to determine whether or not they have jurisdiction. Then, in this state, the case is reviewed by a panel of attorneys, to see if the case has any merit. The case is then forwarded to a prosecuting attorney, who has the authority to hire an investigator and/or have the formal review done on the appraisal report under STANDARDS 3 and 4 of USPAP. At that point, the prosecuting attorney might decide, “we don’t have enough evidence to prosecute” or “there’s nothing wrong with this appraisal, the reviewer says it’s fine.” If that is the case, the matter is resolved, and the case is closed. If there are problems that are indicated by the investigation or the appraisal review, then formal disciplinary action is warranted, and the case will go forward from there. In many situations, the attorney will negotiate a consent agreement (sometimes it’s called a settlement agreement or a consent order), which is a negotiated settlement between the state and the appraiser. It is the administrative equivalent of a plea bargain. 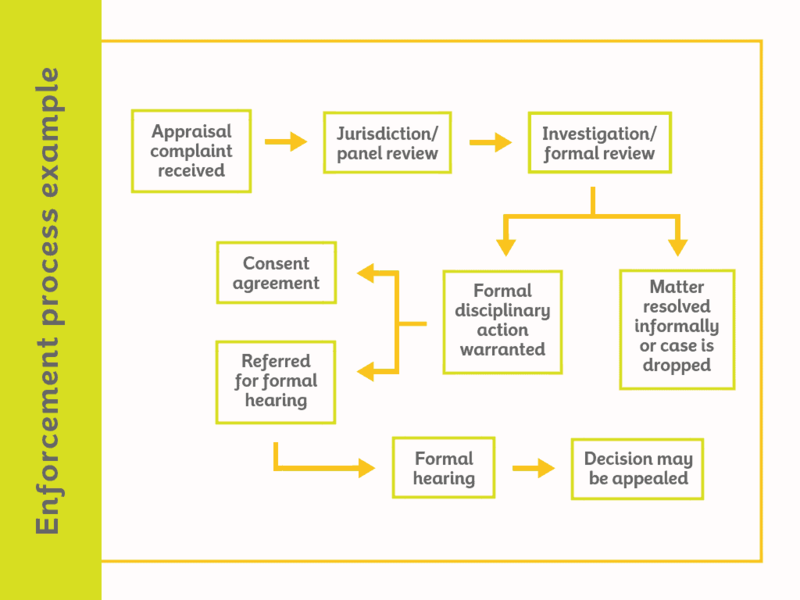 If the parties do not come to a consent agreement, then the matter is referred to a formal hearing. In some states, the hearing will be in front of the appraisal board or commission; in other states, the hearing will be in front of a hearing examiner or an administrative law judge. Once the formal hearing takes place, the party responsible for issuing a decision, whether it’s the administrative law judge or the board, issues the decision. In most cases, the decision may be appealed, usually to some level of state court. For all the differences among the states as to how they handle appraisal complaints, the one thing that many (if not most) states have in common is that the process is complaint-driven. In other words, the state enforcement agency doesn’t go out and try to find violators—they’re not out hiding behind billboards with a radar gun like a police officer looking for speeders. State appraisal enforcement agencies typically don’t have the resources to go out and run their own investigations or initiate sting operations against appraisers. These agencies act upon complaints filed by interested parties. In many cases, no one from the state knows about a potential violation unless a complaint is filed. Appraisal complaints can be filed by government agencies like HUD and government-sponsored enterprises like Fannie Mae and Freddie Mac. Individual mortgage lenders file complaints, appraisers file complaints against other appraisers, and sometimes attorneys file complaints. As an appraiser, you don’t want to have a complaint filed against you, and you certainly don’t want to be the subject of a complaint that results in disciplinary action. Learn about common violations and how to avoid them in my top-rated CE course: That’s a Violation. Looking to upgrade your appraisal license? Learn more with our free upgrade guide. Packages with payment plans are available.